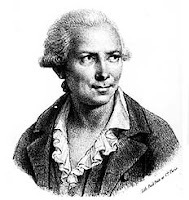 At ChessCafe, GM Karsten Muller [pictured] analyzes Paul Morphy's famous rook sacrifice. A few weeks ago, Intermediate School 318 assistant principal and chess coach John Galvin [pictured] charged $8,000 to his personal credit card so I.S. 318’s champion chess team could travel to the Grade Championships in Dallas, Texas. Eight thousand dollars is a lot of money for nearly all of us; on a teacher’s salary, it’s an astronomical sum. But not spending the money would’ve meant the I.S. 318 chess team – the best and winningest junior high chess team in the country, bar none – might not have been able to compete. More than 65% of I.S. 318’s students (and 87% of those who are members of the chess team) are from homes living below the poverty line and the cost of travel is prohibitively expensive for nearly all of the school's parents. I.S. 318, perpetually underfunded in even the best of times, has seen its budget decimated by a series of deep cuts over the last few years. The best chess team in the country, despite having students who work incredibly hard and a staff whose dedication is astonishing, might not be able to compete in the future. Because of money. Brooklyn Castle is a documentary that is as much about the five young teens it follows as it is about the ability for public schools to do great things when they have the resources. Once we complete our film we will take it to cities across the country and have local screenings to raise awareness about how vital this afterschool program, and others like it, are for schools. We’re also organizing chess tournaments that pit I.S. 318’s chess team against those of some of the most brilliant minds in this country – at places like Harvard and Columbia and the Google campus – so the kids realize those places are within their reach, and word gets out that public schools across the country are suffering from the crushing effects of budget cuts. We learned in making this documentary that, even with a staff that cares and students that work hard, a lack of resources can undermine even the most hard-won achievements. And we don't think that's fair. We are very close to completing Brooklyn Castle, but we’re still 17k away from a having a film that’s ready for theaters. We cannot finish the film without your help! Please support – and help spread the word about – our Kickstarter campaign, so we can share the story of I.S. 318 with a nationwide audience and make a positive impact on public schools and school children. By the way, that tournament that John Galvin spent $8,000 getting the kids to? The 8th graders came in first place. On Sunday, I drew this game in a Swiss tournament at the Marshall Chess Club. 36.Ra7+ Bf7 37.Nc5 Kg6 38.Kf2 Bd5 39.Rd7 Rxd7 40.Nxd7 Kf7 41.Nb6 Ke6 42.Na4 Kd6 43.Nc5 Bf7 44.Ne4+ Ke7 45.Ke3 Bd5 46.Ng3 Ke6 47.Ne4, draw. Yesterday I won this game at the Marshall Chess Club. 33.Nf3 c5 34.Nd2 Nc6 35.Nc4 Bg3 36.Kd3 Ne7 37.Nxa5 Nxf5 38.Nb7 Nh4 39.Nxc5 Nxg2 40.a5 Ne1+ 41.Ke2 Nc2 42.Kd3 Na3 43.a6 Bb8 44.Nd7 Ba7 45.Bd4 Bxd4 46.Kxd4 Nb5+ 47.Kc5 Nc7 48.a7 g5 49.Nxf6+ Kg7 50.Ne8+, Black resigns. 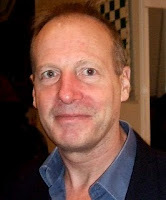 The Marshall Chess Club presents a lecture by international grandmaster Nick De Firmian. "Report from the World Youth Chess Championship"
GM Nick De Firmian is acclaimed as one of the world's leading experts on chess openings. 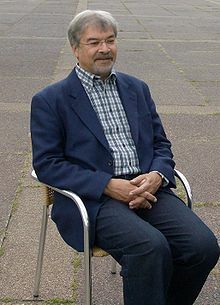 He taught the supercomputer Deep Blue the opening moves it used to defeat world champion Garry Kasparov in 1997. 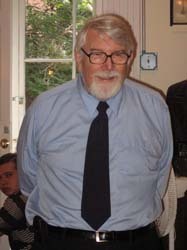 A three-time U. S. chess champion, he has represented the United States in seven chess Olympiads and three world championship cycles. Nick is the coach of the U. S. delegation at the world chess championship taking place in Brazil from November 18-26, 2011. The delegation is composed of 64 American players, including 16 members of the Marshall Chess Club. 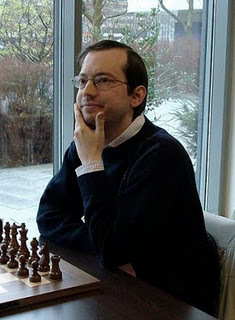 Lev Zilbermintz [pictured] played the black pieces on board one in this correspondence game, from a team match at Chess.com. 33.Kd3 Bg3 34.h5 Ke5 35.Kc4 Kd6 36.Kb5 Kc7 37.a4 Bf4 38.b4 cxb4 39.Kxb4, draw. Frederic Fournier, at Contre Gambit Philidor, analyzes my game as Black against Ed Kopiecki. On Sunday, the New York Knights won the championship match in the United States Chess League, for the second time in three years. I hope this will have been the best book written on chess instruction and how best to learn! Even Fischer Random! Copy (autographed) $54 - plus $6 shipping. If one needs to call: (917) 668-9362. To those I have promised a copy, please call to make arrangements. Many, many games + 8 pages of photos! 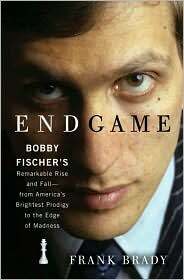 Price of the book coincides with the year 1954 - when I started coaching Fischer. Available for shipping by this Monday, Nov. 21st. Not available anywhere else. I finished with a score of 1-1-2 in the under 2300 tournament, at the Marshall Chess Club. 15.h3 e5 16.fxe5 Nxe5 17.Bh2 g6 18.Rad1 Nfd7 19.Nd5 Qd8 20.Nd4 Rh5 21.Nf3 Bxd5 22.exd5 Bf6 23.Nxe5 Bxe5 24.Qf3 Qe7 25.Rde1 f5 26.Rf2 Kf7 27.Rfe2 Qf6 28.c3 Qd8 29.Bc2 Bxh2 30.Kxh2 Ne5 31.Qf2 Kg8, draw. These games were played on Saturday at the Marshall Chess Club. 36.Nf1 Nc4 37.Ra4 Nxb2 38.Ra3 a4 39.Nd2 Rd7 40.g4 Rxd2+ 41.Kxd2 Nc4+ 42.Ke2 Nxa3 43.gxf5 Kd5 44.Kf2 Ke5 45.Kg3 Kxf5 46.Kh4 Nc4 47.Kh5 Nxe3 48.Kh6 Ng4+, White resigns. 17.f5 Nce5 18.Qe2 a6 19.fxe6 fxe6 20.Rxf8+ Qxf8 21.Rf1 Qe7 22.Rf2 Rf8 23.Rxf8+ Qxf8 24.Nd1 Nc5 25.Bc3 Qf4 26.Bd2 Qg3 27.Be1 Qf4 28.Bd2 Qg3 29.Be1 Qf4, draw. The Lewis Chessmen are on display at the Metropolitan Museum of Art's branch, known as The Cloisters. Frederic Friedel (co-founder of ChessBase) and Frank Brady (author of Endgame) are among the guests, on this episode of Radiolab. The Marshall Chess Club cordially invites you to a reception and lecture honoring newly wedded Marshall Chess Club governors Laurie and Brian Hulse. Please join us for a celebratory reception in honor of the marriage between Laurie and Brian Hulse. Both Laurie and Brian are members of the Marshall Chess Club board of governors, and they first met at the club! 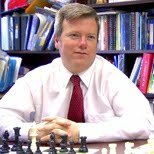 Following the reception, Brian (a FIDE master and 1978 Marshall Chess Club champion) will give a lecture on "Pawn Down Endgames." Frederic Fournier analyzes my new move 7...Bd6, at Contre Gambit Philidor. 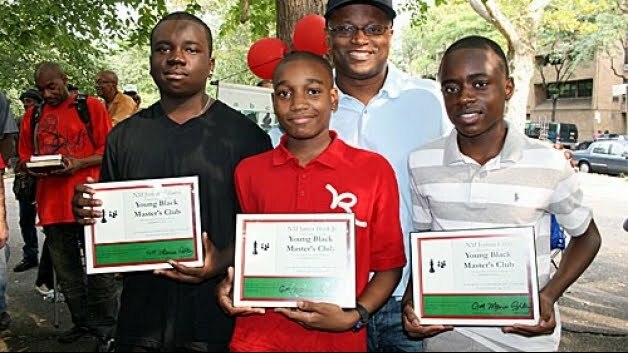 3 African-American Masters in "NY Times"
Three African-American chess players, who became national masters at age 12, are featured in this article from The New York Times. On Sunday, I drew this game in a FIDE rated tournament at the Marshall Chess Club. 34.Kc3 Kg7 35.Bd3 c5 36.a3 Bf3 37.b4 cxb4+ 38.axb4 a5 39.bxa5 bxa5 40.Kc4 d5+ 41.Kb5 Be4 42.Be2 Kg6 43.Bg4 e5 44.dxe5 Kxg5, draw. 37.f4 Ke6 38.Kf3 Bf1 39.Bb3+ Ke7 40.f5 Bxh3 41.Bc4 d5 42.Bxd5 Bf1 43.Ke3 Kd6 44.Bb3 Ke5 45.Bd5 Bg2 46.Bc6 h3, White resigns. 38.g4 Kg5 39.Kg3 f5 40.gxf5 Kxf5 41.Kf3 Ke5 42.Ke3 f5 43.Rb5+ Kf6 44.Kd4 Kg5 45.c5 Ra6 46.Rb2 f4 47.Kd5 Rf6 48.c6 Rf5+ 49.Kd4 Rf8 50.c7 Rc8 51.Rc2 Kg4 52.Rc3 h5 53.Ke5 Re8+ 54.Kd6, Black resigns. 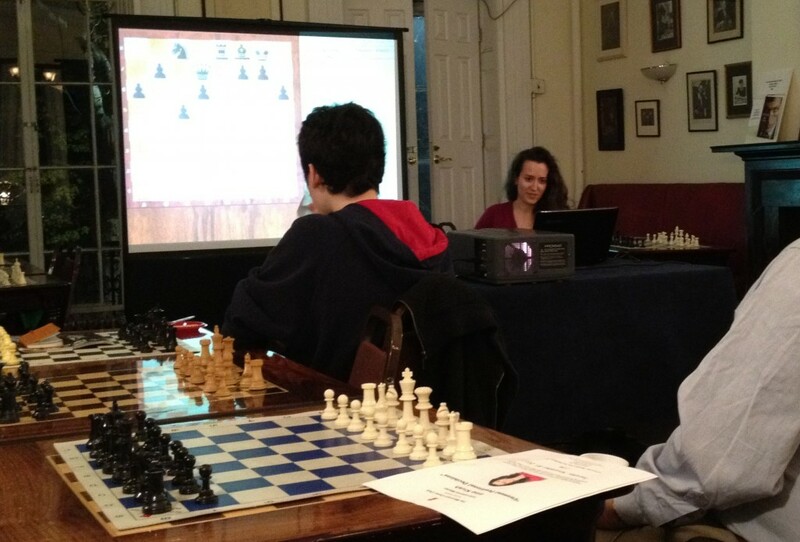 Blogger Brooklyn 64 describes Tuesday's lecture by IM Irina Krush at the Marshall Chess Club. 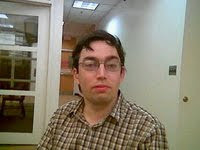 Until recently, I did not play at the Internet Chess Club. But a student of mine, who wanted lessons via the ICC using Skype, bought me a one year membership. At the end of my two hour lessons, if time permits, I sometimes play casual games against my students. On Tuesday, I tried a new move 7...Bd6 in the Philidor Counter Gambit during one such game, at a time control of 20 minutes per player. Instead of revealing my student's ICC handle, I will give his initials. 26.Qf5 Ne7 27.Qf3 Qg5 28.Kh3 Ng6 29.Raf1 Qh4+ 30.Kg2 Nf4+ 31.Qxf4 Rxg4+ 32.Qxg4+ Qxg4+ 33.Kh2 Qe2+ 34.Kh3 Qh5+ 35.Kg3 Qg5+ 36.Kh3, draw. Review of "Endgame" at "ChessCafe"
At ChessCafe, Steven B. Dowd reviews Frank Brady's Endgame. Here is the review, by Patrick Wolff, in the Wall Street Journal. At Contre Gambit Philidor, Frederic Fournier analyzes my recent game as Black against Wesley Hellner. Nelson and Katie Dellamaggiore of Rescued Media need your help in funding their documentary film Brooklyn Castle. On Sunday, I drew this PCG in a game/30 tournament at the Marshall Chess Club. 16.g4 Ng3 17.hxg3 Qxg3+ 18.Kh1 Qh3+ 19.Kg1 Qg3+ 20.Kh1 Qh3+, draw. At the Marshall Chess Club, I drew this game on Saturday in a game/60 tournament. 35.Ra7 Kf6 36.Kh2 g5 37.h4 gxh4 38.Ra4 h5 39.Rxh4 Kg5 40.Re4 e6 41.Kh3 Ra2 42.Re5+ Kf6 43.Rxh5 Rxa3 44.Rb5 e5 45.Kg4 Ra4+ 46.Kg3 Kf5 47.Rc5 f6 48.Rb5 Ra6 49.Rb4 Ra5 50.Rc4 Ra6 51.Rb4 Kg5 52.Rg4+ Kf5, draw.